So much has happened since my last update. We have accomplished an incredible amount, and I couldn’t be more proud of my team! A couple of weeks ago we began meeting with selected Chefs from local restaurants. Our farm associates introduced themselves, described our farm business and products, and had the opportunity to ask the chef’s questions to gauge interest in working with us, as well as gain perspective on the purchasing side of things. Casey and Guayo met with Owner & Chef Arash from Cafe 15 (on 15th & Jefferson in Downtown Oakland). Paul and Ale’ah met with Chefs Rico and Yoni from Flora (on 19th & Telegraph in Uptown). Tessa met with Owner & Chef Tanya from Brown Sugar Kitchen (on 25th & Mandela in West Oakland). We were very pleased with the response we got from each of the three restaurants we met with. These Chefs were each incredibly generous with their time (and especially generous with letting us sample their culinary creations while we took in the ambiance of their business). We look forward to the opportunity to work with each of these restaurants and were thrilled with their resounding support for our program. 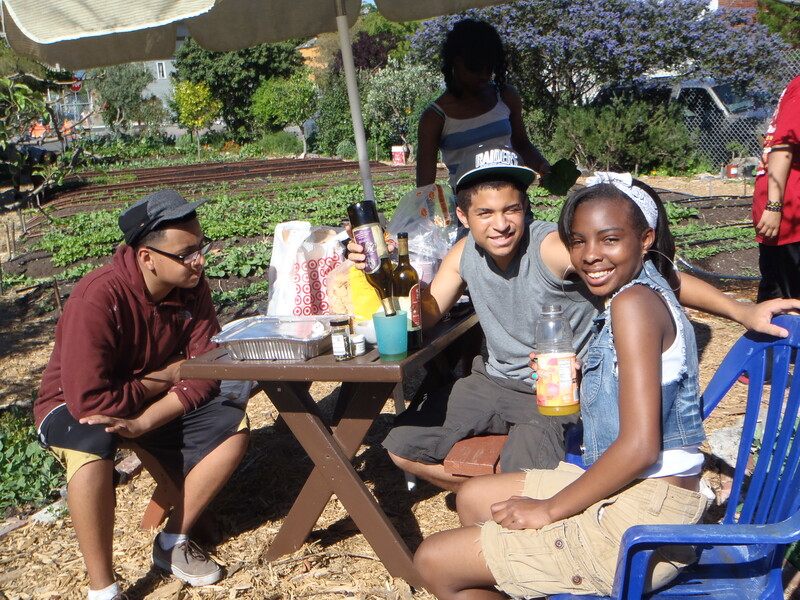 Chefs Yoni and Rico were able to visit us on our Open Farm Day on Saturday, April 14th. They got the opportunity to meet our group and see our production space. This was our first harvest day, as well. We sold them specialty crops on the spot and were put on the menu that very night!! Yesterday we did another round of harvests — a quantity of radish, arugula, braising greens, pea shoots, cress, nettles and more (!) which tripled our bounty from the week before. It was a mad-house of harvesting, processing and packaging! All hands were on deck carefully harvesting individual crops, giving them a cold water bath, scrubbing/rinsing a number of times, spinning them dry, weighing them on a scale and packaging them in our salvaged wine crates. In addition to building relationships with restaurants and beginning harvests and sales, we have been continuing our classroom learning sessions. In the last few weeks, we have dived into economic theories and business planning, discussed positive and negative externalities of the industrial and local food system, and had lessons pertaining to soil fertility and plant management/care. We have eaten a TON of salad from our productive kitchen garden and been looking in sharp outfitted in our dark brown Carhartt overalls.Our team brainstormed ideas for our logo with the guidance of a professional graphic designer. We have arrived at our graphic and tag-line, which are in their final phases and soon to be revealed (perhaps along with an exclusive dance video in the field) … Stay tuned!